Ek Mukhi Rudraksha, or single face Rudraksh, is a very rare Rudraksha and in Hinduism it is believed to be the representation of Brahman - the supreme truth. (Not to be confused with Lord Brahma). 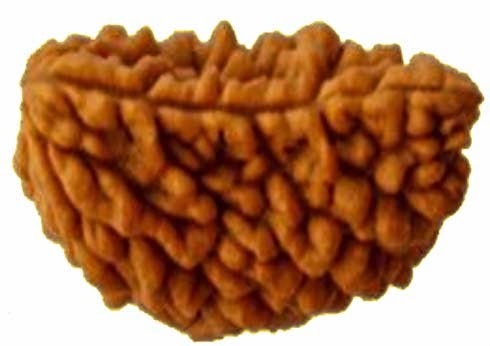 Ek Mukhi Rudraksha is like a half moon or in the shape of cashew nut. It represents Lord Shiva with all his attributes of creation, preservation and destruction. Ek Mukhi Rudraksha in round form is very rare. It is so rare that human beings rarely get to see them. The one-faced Rudraksha is worshipped for attaining moksha or liberation. Some people also believe that if Ek Mukhi Rudraksh is present at home, Goddess Lakshmi will always be present at home. It is widely believed that peace and prosperity will be forever be present in the place where ek-mukhi rudraksha is worshipped. The person wearing the rare rudraksha attains the power of single-minded focus. It must be noted that just by buying a one-faced Rudraksha you are not guaranteed of luck or wealth. You need to work hard with dedication and determination. The Rudraksha only helps you in single-minded focus. Certain physicians use it to diagnose diseases. The rudraksha is worn around the neck capped with gold or silver. All horoscope related problems will be solved by wearing the Ek Mukhi Rudraksha . The rudraksha is beneficial to people suffering from diseases of heart, veins, head, eyes, and veins. It also has power over the pineal gland, pituitary gland and hypothalamus gland.